Our BEACH ACCESS is OPEN. CLOSER TO THE OCEAN than some oceanfront homes! The OCEAN is steps away from our fresh and comfortable SECOND ROW beach home! Our home is decorated to perfection and we have a brand new pristine kitchen! We also have an exceptional outdoor area with porches, BEAUTIFUL OCEAN VIEWS and nice landscaping. Our home has 2 queen beds, 2 double beds, and 2 twin beds. Our two decks and our sunroom are the perfect place to read, relax, and dine under the stars! This is a FIRST CLASS HOME with BEACH ACCESS 10' away and THE ATLANTIC OCEAN a few steps away! We offer 4 Amenity Cards with a weekly rental. We are located in the CENTER of Fripp Island and have a FABULOUS BEACH 24/7! The Beach Club with pools, tennis courts, restaurants and the Fripp Food Court is less than a 5 minute walk. We promise you will love our home. We want you to enjoy Fripp as much as we do! We love to escape from the traffic in Atlanta to the peace and beauty of Fripp Island. Our guests always tell us that our home is the perfect beach house... Comfortable, fresh coastal furniture and decor and literally a stone's throw to the beach. 2nd ROW Beach Cottage so close to the ocean! Amazing ocean views from our second row beach house! Our home on Rock Beauty is closer to the ocean than some oceanfront homes! Fantastic ocean view even from the kitchen! The house has an open structured garage under the house. The living room is an open layout connected to the kitchen. It has a TV, 2 comfy couches, and 2 cozy chairs (can seat 8 people comfortably; 10 at most). Salt, pepper, paper towels, sponge, dish soap, and dishwasher detergent are provided. The puzzles, card decks, and board games at the house make family game night more fun than ever before. Kayaks may also be rented through Excursions. Boats can be rented through Excursions. We have visited Fripp for 12+ years. We have stayed in some very nice properties. This, however, was the best! House was very clean when we arrived, arrangement was perfect and the location could not have been better. We will definitely try to stay here again!! You know how you go to a vacation house and they have three forks and a toaster that doesn't work? That's not this place!! No detail is missed! 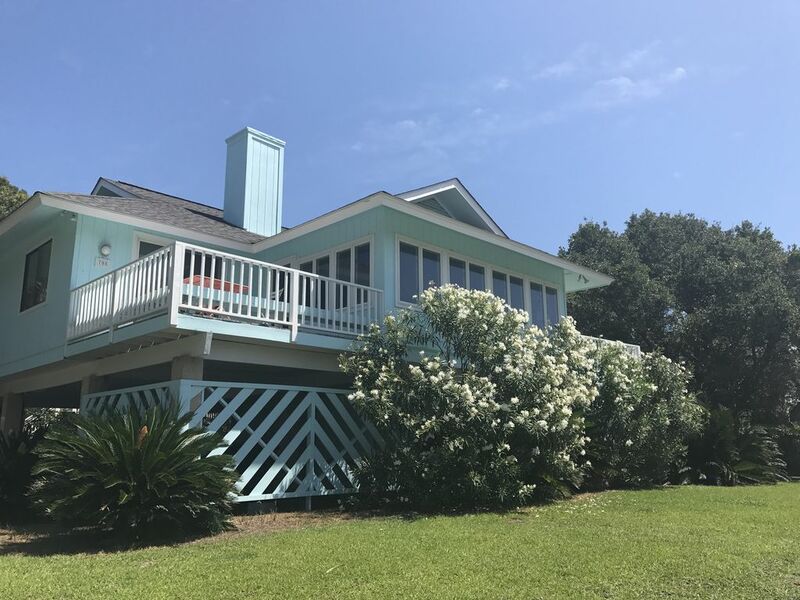 Fully stocked kitchen, tons of linens, beach towels, an entire room full of beach equipment that most owners lock up (kites, boogie boards, chairs, floats, etc), new gas grill, the works! Beds are super comfy and it is so close to the best beach access on Fripp! Can't say enough about this place! Our new fave on Fripp! Great location to beach access! Our family loved Fripp Island! The house was very close to the beach access. The sunroom was really nice and open to see the ocean view. This house was perfect for our family. It had everything we needed and was in a perfect location. We could easily walk to the beach every day and didn't need to transport our belongings via golf cart; like many others. The handicap beach access is great because it makes for a much easier access to the beach. We could make our way back for lunch (or Bloody Mary's) and head back out in the afternoon. FANTASTIC. This home had great space and the two porches allowed us to look out at the ocean while our teenage kids could hang out on the other. Great home and even better location on the island. We will be back!! Please add a Cleaning Fee of $ 200 if you are staying less than a week. We include 4 Amenity Cards in weekly rentals. If you are staying less than a week Amenity Cards are $ 35-50 per guest. All guests 13 years of age and older need a Card.